Cilantro is featured in dishes cooked everywhere from Spain to Mexico, the Middle East to the South America. Not only is it used in many tasty and exotic recipes, but it's also associated with many health benefits. 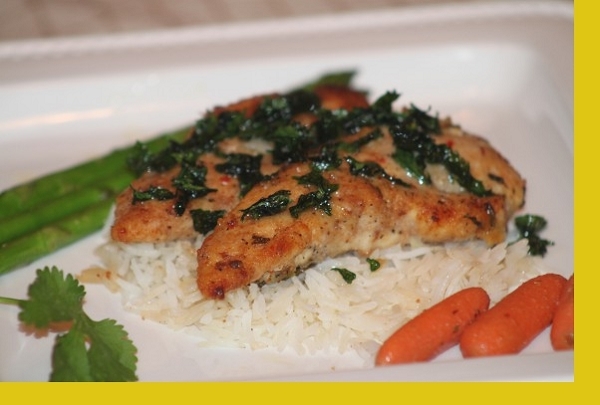 This tasty Chicken dish incorporates ample amounts of cilantro, garlic, lemon and spices. Served over rice. 1. Preheat oven to 375 degrees. 2. Place the rice from the bag into the provided large pan spreading evenly to cover the pan. 3. Add 2 tablespoons of oil to a non-stick skillet and heat on medium high heat. 4. Saute breaded chicken 2 minutes per side in the skillet. 5. Transfer the chicken to the pan placing on top of the rice. 6. 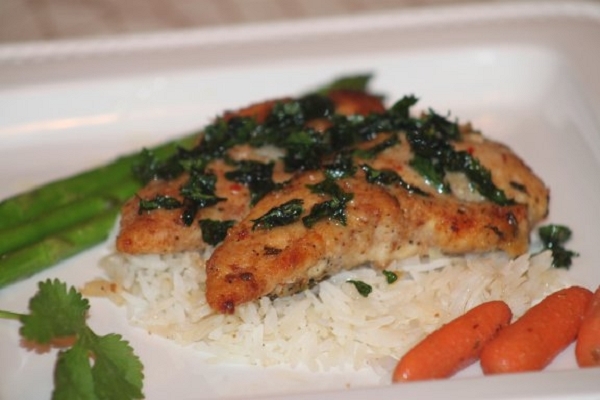 Pour the cilantro sauce over the chicken and rice, cover with foil then bake in the oven for 15 minutes. Always support the bottom of the pan when removing from the oven. This is a delicious meal. The secret is in the sauce, which I believe is your specialty Maria. My husband and I just love the combination of the cilantro sauce over the chicken and the rice. We never miss ordering it. Thank you. We've enjoyed many dinners from Maria's Gourmet Kitchen, and one of the things I love, is that most of them serve three people even though they say they serve two. Now I have lunch for the next day! We plan on continuing to use Maria's, as you can't beat the convenience paired with the well thought out and perfectly prepared meals. The chicken cilantro is absolutely delicious. The breading on the chicken is light and the sauce is very flavorful. One of my favorites. Another great dish. I can't believe how easy this dish was to prepare. We have yet to try one of Maria's dishes that the family doesn't like. Just made this for lunch for the family today. smells and tastes great! Crazy good and so easy! This is a delicious meal. Cilantro and garlic has made a difference. I highly recommend it. Try it!